​Liverpool secured a vital 1-0 against​ Brighton which takes them top of the ​Premier League after three games, unbeaten and the only team in the division yet to concede a goal. ​Mohamed Salah scored the only goal of the game inside the first half in what was a closely contested affair. Despite late pressure from Brighton, Reds' shot stopper Alisson got the job done for the Reds with some important saves and plenty of command to galvanise the ten outfield players in front of him. Not straightforward, but a deserved win none the less. Thought James Milner was exceptional once again, while Keita just left me shaking my head he’s that good - makes it look so effortless too. It didn't take long for last season's Golden Boot winner to spring into action. The famous front three were all involved as Sadio Mane, Roberto Firmino and Salah all linked up before a first time shot from the Egyptian clipped the inside of the post to give the Reds the lead. It could have been more as Trent Alexander-Arnold struck the frame of the goal with a free-kick from around 20 yards out. The visitors were struggling to get the ball to their target man Glenn Murray as Liverpool's high pressing was leaving little room for error. Liverpool were given a wake-up call as Brighton were almost back in the game early in the second half, but Anthony Knockaert sliced his effort wide after some effective hold up play from Glenn Murray. The Reds held on late in the second half, unable to grab a second, and ultimately had to rely on some terrific goalkeeping from Alisson to get over the line. Having won back-to-back Premier League games going into this one, it was vital that Liverpool kept their momentum going after learning that potential title rivals​ Manchester City had dropped points earlier in the afternoon. The Reds' front three ultimately got the job done, but it was not the goal fest many were anticipating prior to kick off. Despite the nervy nature of the win, there were plenty of positive performances throughout Jurgen Klopp's side from Alisson to Andy Robertson to Gini Wijnaldum. James Milner too deserved credit as he started the winning move off by overturning possession from Yves Bissouma and setting the Reds on their way with the counter-attacking move. Starting XI: Allison (8); Alexander-Arnold (7), Gomez (6), van Dijk (7), Robertson (7); Wijnaldum (7), Milner (6), Keita (7); Mane (7), Salah (8), Firmino (7). Cool, calm, collected and did everything that was asked for him. Liverpool's expensive new signing from Roma stole the show at Anfield with his composure and how it transmitted to every Reds' supporter in the stadium. A similar end to a game in recent years would caused countless destroyed fingernails at Anfield, but the reassurance provided with a top class goalkeeper is welcome relief to Liverpool fans digits. Despite his price tag, the 25-year-old Brazilian appears to be taking the pressure that comes with being a Liverpool goalkeeper completely in his stride. The Guinean midfielder has had better games in a Liverpool shirt and has already shown what he's capable of, but a misplaced pass at the start of the second half almost cost his side a goal at a key moment in the game. Having only just arrived at Anfield after a year of waiting, Liverpool's new number eight will have to play with a more level-headed approach as the 25-year-old was guilty on many occasions of sloppiness and mis-placed passes. Makes sense to bring on Hendo for Naby Keita. Scariest thing about Naby is how much he can still improve. When he tires his positioning is a bit off but what a skillset the kid has. The visitors wasted a golden opportunity to get into the game at the start of the second half and left Chris Hughton and the travelling Seagulls fans thinking what might have been. 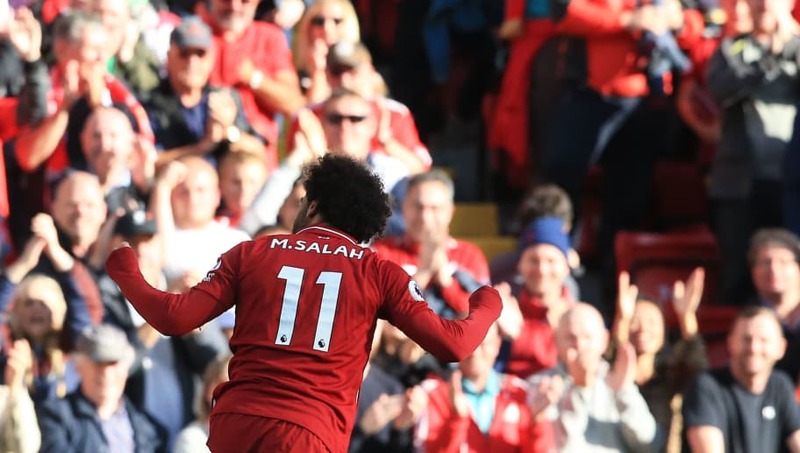 Despite being outplayed by the home side for the majority of the game, Liverpool were still prone to the odd mistake and on another day Brighton's midfield might've capitalised. Anthony Knockaert, free in space on the penalty spot, sliced the visitors best chance at taking a point away from Anfield. Goals were not been an issue in Brighton's last game against Manchester United, but consistency could be a key factor in how the Seagulls fare this campaign. Murray committed himself to the cause and battled hard on the scraps that were being offered to him in midfield. The travelling Brighton supporters were treated to a man who commits his all for the shirt and continued his attacking threat up until the last whistle. Despite being the losing side, his pressing and his battling with Liverpool's deep-lying midfielders was admirable and should provide Hughton with a sense of optimism to take from this game with a reassuring performance. The Malian gave the ball away on multiple occasions and ultimately made the mistake that led up to Liverpool's goal. There's no doubt that he will be given more time to impress for Brighton but the pace of the game looked to flummox the 21-year-old on occasions. On a day when Manchester City dropped points, Jurgen Klopp can reflect on this game and how far his side have come since he took charge in October 2015. Earlier in his tenure, the Reds might have thrown away this sort of fixture in the dying seconds, but not today. The Reds travel to Leicester next on September 1st. For Brighton, they can take many positives from that game as there may reassuring signs of progress from Chris Hughton's side. The Seagulls host Southampton next on August 28th.